Visitors to Wast Water in the Lake District can see evidence of the same geological features that give the Col d’Izoard its spectacular if desolate aspect. The scree formed as rocks are broken up of hundreds of years by ice and weather has left the Col with the kind of other wordly appearance that makes it an icon of the Tour. The town of Briancon lies to the south of the Izoard and the combination of this climb and the Col du Galibier virtually guarantees that the highest town in Europe will feature on the stage. Raphael Geminiani once said that ‘…the Tour is won at Briancon’ such is its position between the two cols. The Izoard has featured in more than thirty tours since 1922 and as recently as 2011. Some of the most inconic images date from the 1950’s, the black & white photos increasing the impression that the cyclists where toiling over a lunar landscape. Reaching a steepest gradient of 11%, it is a twenty mile ride to the summit nearly 8,000 ft. above sea level. The remaining rock formations and the occaisional pine tree surrounded by the scree is known as the ‘Casse Deserte’, the Broken Desert. The first time the Izoard featured on the tour it was part of a 170 mile stage that started in Nice and finished not surprisingly in Briancon. Philippe Thys won the stage after reaching the top of the col first, one of five wins from that years tour. Thys was undoubtably a legend of the tour already by 1922 having won two years running in 1913 – 14 and again, following World War One, in 1920. He actually won more stages in 1922 than he acheived in 1920. The rider most associated with the Col d’Izoard is Louison Bobet. Bobet’s legend was fuelled by his rides over the col and he is immortalised with a plaque on one of the rock formations in the Casse Deserte. Bobet was the first to the top of the col three times, first in 1950. 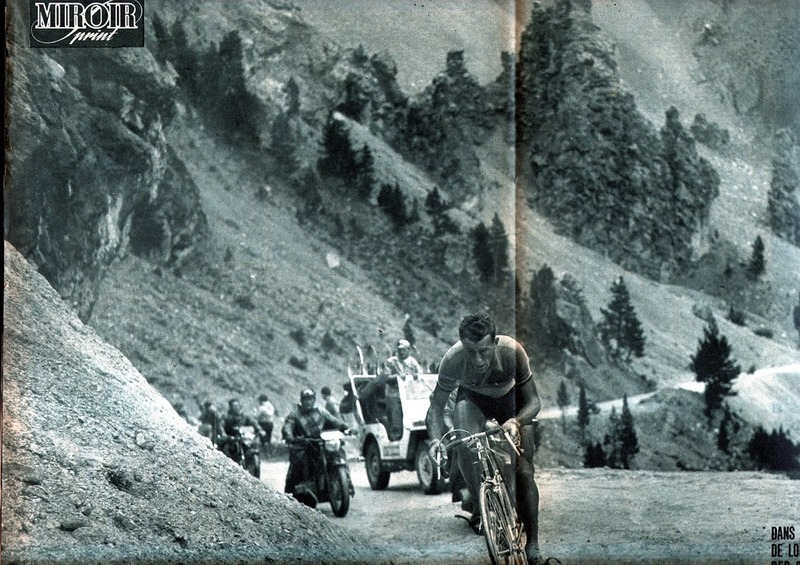 In 1953 Bobet broke away on the Izoard finishing five minutes ahead of the next rider and taking the lead in the race by gaining eleven minutes on his nearest rival. Some people have described this as the ride of Bobet’s life although he was to reach the top of the col first again in 1954. A close rival to Bobet as the king of the Izoard and a contempory was Fausto Coppi. Coppi book ended Bobet’s first summit victory reaching the top of the Col first in 1949 and 1951. Coppi’s cameo portrait sits on the plaque next to Bobet’s in the Casse Deserte.